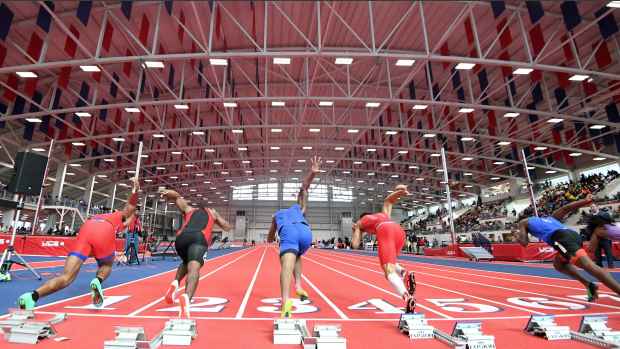 LYNCHBURG, Va. - The VA Showcase would like to announce Justin Byron (Nansemond River), Rick Wallin (Rustburg), Brandon Miles (FloSports), and Winston Brown (FUMA) as honorary meet referees for the 2019 VA Showcase. Each of these individuals has helped make the VA Showcase into what it is today and also helped lay the ground work for it years in advance. Without the tireless work and passion of these individuals this event and many events like it would not be possible. Justin Bryon - Former Nansemond River Coach who is now at Cornell. He and his team won multiple championships and year after year provided some of the best competition in the nation. Their team served as an anchor to bring more teams and elite athletes to the VA Showcase over the past three years. Rick Wallin - Coach Wallin has become a staple at LU's indoor track. He coaches not only Rustburg high school but the middle school as well and every second between those tasks involves him helping officiate. He is one of the officials that was there day one and fired one of the first starts of the VA Showcase. The meet is happy to have him back starting. Brandon Miles - Meet the founder of MileStat.com. Brandon has always been a guy with a passion and on a mission. He is one of the hardest working people in the sports media industry and without all his hard work this meet, the rankings, and the coverage would not be possible. Winston Brown - Longtime Fork Union Military Coach Winston Brown has been one of the biggest allies to our event year after year. He selflessly moves his events around ours to grow our meet's size. He and Brandon Miles started these mega events over a decade ago with the MileStat.com XC Invitational. Winston Brown is not only a great coach but also someone you want to partner with as he is the ideal partner in this sport. These individuals join Ernest Carter and Claude Toukene as having this honor.